In 2007, the Wynne/McGuinty government secretly passed into law two acts (Psychotherapy Act and Controlled Act of Psychotherapy) that, working in tandem, allow psychologists and psychiatrists to monopolize all mental healthcare services. These acts effectively allow these mental health professionals--self-appointed as superior--to redefine all manner of natural, traditional, spiritual and holistic approaches as ‘psychotherapy’ and then to restrict who can do ‘psychotherapy’. They went farther by severely restricting who is permitted to assist another with any human issue - emotional, thinking, reasoning, cognition, perception, memory, judgment, insight, behaviour, communication, social functioning or mental (including spiritual care). After we picked ourselves up off the floor, we realized that we had two choices: allow tyrants in the Ontario medical/pharmaceutical cartel to eliminate us from the healthcare industry or (gasp!) fight back, which, for us, is not natural. We are professionals in the healing arts and particularly of the non-drug, non-surgical variety. Between us we have decades of training and experience in our chosen fields (Reiki, Reflexology, Natural Nutrition, Hypnotherapy), with a litany of happy clients. Together, with our other 10,000 holistic practitioner colleagues in Ontario (mostly women), we save our imploding and indisputably dangerous healthcare system $7-10 billion annually, since Ontarians pay for our services out-of-pocket. Holistic practitioners have an exemplary safety record, as evidenced by the Fraser Institute’s two major studies on holistic practitioners; we cost the ‘system’ not one dime. So you would think our Premier -- the increasingly maligned Kathleen Wynne -- for whom violating personal liberties and undermining our democracy seems to be a favorite pastime, would be kissing our feet. As the law stands, unless you’re a registered psychotherapist, psychiatrist, psychologist, MD, nurse, occupational therapist or social worker, you are not permitted to assist any human with the bumps and bruises of life. But evidence shows that these are the very groups least likely to succeed in helping anyone with any of life’s bumps and bruises, while increasing the likelihood that all issues will worsen. The 14th Controlled Act of Psychotherapy is law and could be proclaimed any day and thus become enforceable at any time. Proclamation is a mere formality of the Lieutenant-Governor’s signature. So far, our efforts as Co-founders of the Stop Psychotherapy Takeover movement have held off the proclamation of the Controlled Act for almost 3 years, as we work hard to warn and mobilize the public. Psychologists and psychotherapists are free to interpret the terms ‘psychotherapeutic technique’ and ‘serious disorder’ as they wish. he College of Registered Psychotherapists of Ontario (CRPO) was given the power to regulate the field of psychotherapy through the equally unlawful companion Psychotherapy Act, also secretly passed into law in 2007. This particular act was proclaimed, without notice, on April 1st, 2015. The new College wasted no time in exercising its powers to put countless people out of work who were offering psychotherapy and who would not or could not join the College. This was achieved through the imposition of arbitrary credentialing requirements and forced scopes of practice that violate the consciences of many members by requiring training in mental health diagnoses and eventual drug-treatments. Worse, this College activity is specifically in violation of the superior law, the Regulatory Health Professions Act, 1991, whose intent was to ensure that most of healthcare provision was left in the public domain by way of a system of self-regulated associations with VOLUNTARY memberships and no restrictions on those who do not wish to join an association. Once the Controlled Act is also proclaimed, which could be any day, the College will be in a position to enforce all treatments of all human disturbances by verbal or non-verbal means as a ‘controlled act’, restricting the provision of such services to registered psychotherapists, psychiatrists, psychologists, social workers, occupational therapists and nurses. Together the Psychotherapy Act and the Controlled Act of Psychotherapy affect many essential, credible services that are currently performed by over 10,000 Ontario wellness practitioners, trained in diagnosis-free and drug-free treatments. The holistic approaches scheduled for elimination include hypnotherapy, energy work, spiritual care, grief counseling, natural nutrition, weight management, holistic education, family therapy, coping skills training, chiropractic care, meditation, Reiki, Polarity, Reflexology, pet-assisted therapy and many more. 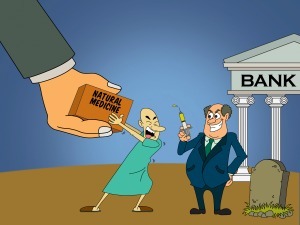 Despite the Supreme Court of Canada repeatedly upholding a citizen’s right to medical autonomy, the Wynne government, to date, has not acknowledged that studies show natural treatments to be safe and that the public is increasingly preferring them as healthcare treatment. If they continue to practice, valued holistic service providers could face up to one year of imprisonment and to $25,000 in fines! Fearing retribution, practitioners are moving their businesses to other provinces in Canada or simply closing their practices. BUT, our research shows that these Ontario laws are the template to be used to monopolize all healthcare in the hands of the medical/pharma cartel right across Canada, so it is safe to say that the medical totalitarianism will follow them across the country. To date almost 10,000 individuals have signed an online petition and some 500 letters have been sent to MPPs to save natural treatment professionals. MPPs have been stone-deaf and non-reactionary. The Minister of Health, a prominent member of the very medical/pharmaceutical group seeking to eliminate their competition through unconstitutional, dangerous and oppressive legislation, refuses to respond to any correspondence from our lawyers. That is not a surprise given the corruption-riddled majority government they represent. Grassroots action (Stop Psychotherapy Takeover) is underway to force the Ontario provincial government to repeal these undemocratic and harmful legislative amendments and to install ‘safe harbour’ legislation to prevent future attacks on natural treatment providers. Anyone who wants to help us collect signatures can find our downloadable FORMAL PETITION at our website www.StopPsychotherapyTakeover.ca and several other ways to assist, including preformed MPP letters and links to our on-line Petition. Especially, we need financial assistance. When man's law tries to subvert the Laws of Nature , failure is inevitable. These "Acts" of government will create chaos because they attempt to subvert the Law of Supply and Demand and they attempt to subvert the Law of Free Will. Strike them out, they will fail anyway, however, if we stop them before they follow the inevitable path to failure we will prevent great chaos. This important article by Grace Joubarne and Christine Massey will be featured in the Summer print and online editions of Dialogue magazine. No matter where you live, this topic is of strategic importance to matters affecting your health and well-being.